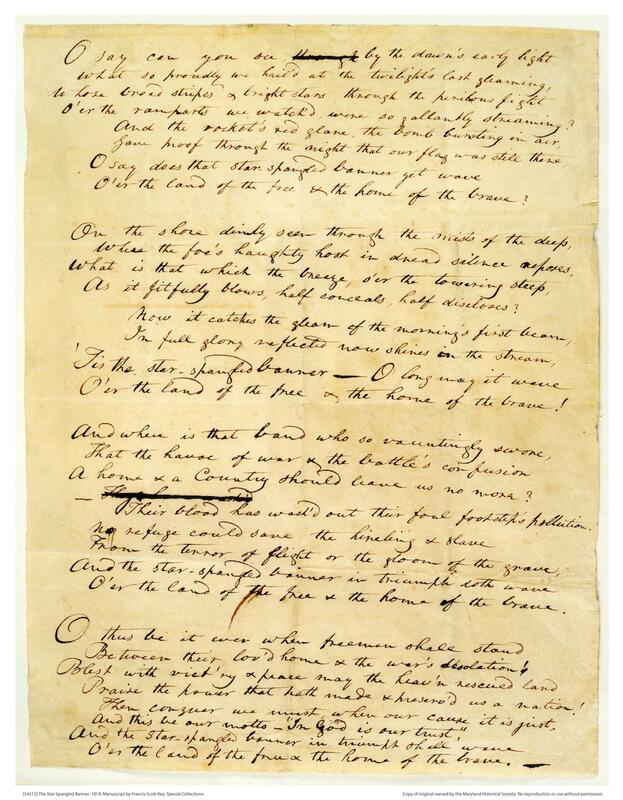 National Anthem History: Early draft of "The Star-Spangled Banner"
This year marks the bicentennial of Francis Scott Key’s “The Star-Spangled Banner,” and there will be commemorations galore (see the Smithsonian’s extensive plans here, and the Maryland Historical Society’s here). Here’s one of Key’s first drafts of the song, including the unfamiliar second, third, and fourth verses. Key, a Washington lawyer, witnessed the September 1814 Battle of Baltimore from a truce ship in the harbor, where he had been confined for the duration of the battle after negotiating for the release of an American prisoner. Key revised his initial on-the-spot draft of the song several times before publishing it as a broadside, titled “The Defence of Fort McHenry.” Various East Coast newspapers republished the song, which was renamed “The Star-Spangled Banner” by early November. Key’s association of the British Army with “hirelings and slaves” was meant to be an insult. As historian Kevin Levin writes, the British Army liberated enslaved people in the Chesapeake region and recruited them as soldiers during the War of 1812. To Key, “freemen,” as he calls Americans, were to be lauded for their patriotic convictions, while slaves who enlisted to gain their personal liberation were to be disdained. Here’s a recorded version of all four verses of “The Star-Spangled Banner” as it might have been sung in late 1814. This version was produced by the Star Spangled Music Foundation, a group of scholars associated with the University of Michigan’s School of Music, Theatre, and Dance. Despite its consistent popularity, the song didn’t become the official national anthem until 1931. Click on the image to reach a zoomable version. My transcript follows. “The Star Spangled Banner,” 1814. By Francis Scott Key. O’er the land of the free & the home of the brave? O’er the land of the free & the home of the brave! A home & a Country should leave us no more ? Praise the power that hath made & preserv’d us as a nation!